Clary Fray just wishes that her life would go back to normal. But what's normal when you're a demon-slaying Shadowhunter, your mother is in a magically induced coma, and you can suddenly see Downworlders like werewolves, vampires, and faeries? If Clary left the world of the Shadowhunters behind, it would mean more time with her best friend, Simon, who's becoming more than a friend. But the Shadowhunting world isn't ready to let her go -- especially her handsome, infuriating, newfound brother. And Clary's only chance to help her mother is to track down rogue Shadowhunter Valentine, who is probably insane, certainly evil -- and also her father. I picked City of Ashes up right after I finished City of Bones. I was a little hesitant because of the unexpected plot twist from the first book. However with some reassurance from my book blogger friends I picked it up. I'm so glad I did! The relationship between Jace and Clary remains quite complicated. Clare created the perfect amount of tension between the two. Simon and Clary's relationship also changes greatly making Clary question her true feelings for both the boys. If you know me I adore love triangles so this book was terrific! Once again the writing is almost flawless. I felt like I was standing next to our heroes fighting the battles with them. The description and character development is absolutely amazing. My only complaint is that sometimes there is too much story for one book. City of Ashes was much smoother organization wise than City of Bones. I loved Simon in this book! In the first book I found him a little annoying and needy, but City of Ashes brought out all of his best qualities. Throughout this book he becomes heroic and independent. Like Simon, Jace went through major changes of his own. He struggles with his emotions and feelings toward the Clave. I loved how this installment explored all the levels the characters had. The end of this book was perfect! I adored it! I think my feelings might have been different if I didn't have a copy of City of Glass right next to me since this one ended in an amazing cliff hanger. Two cliff hangers to be exact. I literally had to fix my jaw because it hit the floor! I was in total shock! "That you freed a possible criminal by trading away your brother to a warlock who looks like a gay Sonic the hedgehog and dresses like the Child Catcher from Chitty Chitty Bang Bang?" Simon inquired. 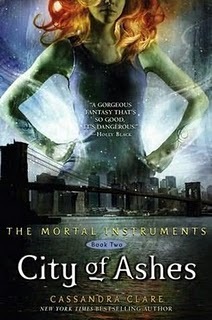 If you liked City of Bones picking up City of Ashes is a must. Don't be discouraged by the unexpected information we received in Book 1. City of Ashes brings an incredible layer to The Mortal Instruments world.